The Euromaidan uprising in Kiev, followed by radical regime change, the annexation of the Crimea and the war in Eastern Ukraine, have shattered European security. The Western response to Russian aggression has been uncertain and hesitant in handling the unfamiliar yet large nation of Ukraine, a country with a complicated past, and one whose history is little known in the rest of Europe. In Ukraine: A Nation on the Borderland, Karl Schlögel presents a picture of a country which lies on Europe’s borderland and in Russia’s shadow. In recent years, Ukraine has been faced, along with Western Europe, with the political conundrum resulting from Russia’s actions and the ongoing Information War. 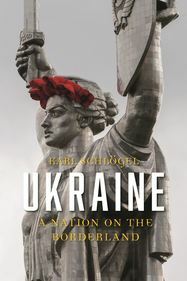 As well as exploring this present-day confrontation, Schlögel provides detailed, fascinating historical portraits of a panoply of Ukraine’s major cities: Lviv, Odessa, Czernowitz, Kiev, Kharkov, Donetsk, Dnepropetrovsk and Yalta – cities whose often troubled and war-torn histories are as varied as the nationalities and cultures which have made them what they are today, survivors with very particular identities and aspirations. Schlögel feels the pulse of life in these cities, analysing their more recent pasts and their challenges for the future.